Seton Hall is home to world-class researchers whose work denotes a broad array of scholarship. In this space, we share their ideas on research and making the most of the academic experience. Rev. Thomas Guarino is Professor of Systematic Theology at Seton Hall’s Immaculate Conception Seminary School of Theology. His most recent book, Evangelicals and Catholics Together at Twenty: Vital Statements on Contested Topics explores the key accomplishments of the groundbreaking, ongoing dialogue between Evangelical and Catholic Christians (read an excerpt here). We caught up with Rev. Guarino to talk about his research. You research, publish and teach, and, you have been recognized for your work. How do you find time to balance all these activities? Of course all Faculty members face this same issue—trying to teach well, do your research, write. It’s work, but I think it’s important for the students to understand that nothing in life comes easily. Any type of noteworthy achievement is the result of intensive effort. Jaroslav Pelikan was a famous historian at Yale University, and he used to tell students “If you have a choice between a great teacher who doesn’t do research, and an average teacher who does research, take the latter.” And his point was that even though the person is an average teacher, he or she is involved with the field, is engaged. So it’s always important to stay with somebody who’s doing at least some research. Do you have clerical responsibilities in addition to your academic work? Of course I’m a priest, and to celebrate the liturgy is part of who I am as a priest. I also try to be available to people, particularly to those who wish to talk about issues affecting their lives. 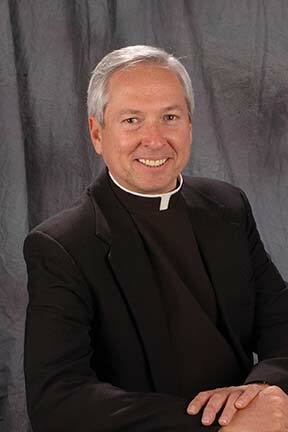 So, yes, I try to be available as a priest to all members of the Seton Hall community. One of the advantages of a Catholic university is that faith and reason are seen as conjunctive realities. The library is a great representative of the tradition of reason, the tradition of seeking knowledge and truth. At the same time, one of the axial and bedrock principles of Catholicism is that faith and reason are not opposed. Sometimes in journalistic narratives they’re presented as opposing points of view, but in the Catholic tradition faith and reason are deeply convergent since both are gifts of God. A Catholic university is a special place where faith and reason come together. In what ways have Seton Hall University Libraries (books, databases, ebooks, ILL service, librarians) assisted your research process? I’ve moved on from this book and I’m now researching a book on the Second Vatican Council. The Church just celebrated the council’s 50th anniversary. In many ways Vatican II was the most important ecclesial event of the 20th century—and its ramifications are still being debated. Vatican II gave birth to official Catholic involvement in the ecumenical movement. The book Evangelicals and Catholics Together is part of a wider spectrum of Catholics being engaged with Episcopalians, Methodists, Presbyterians, Lutherans and Evangelicals in ecumenical dialogue. Inter-religious dialogue is important, too, with Judaism, Islam and other religions. Vatican II gave birth and impetus to all of these initiatives, and the library is a great repository of the documents and all of the commentaries that have been published since then. I deeply appreciate those vast library resources. The databases are excellent; I usually start my own research with Academic Search Premier—I find that to be a comprehensive listing of academic journals. Because of my field I usually then move on to the American Theological Library Association’s (ATLA) Catholic Periodical and Literature Index. The Philosopher’s Index has also been very important to me. We also have a wonderful database Patrologia Latina, which has all of the writings of the early Christian authors in the original Latin, so you have those original texts accessible. And I just discovered—I think this is a recent acquisition—we have the Digital Library of Classic Protestant Texts which has all the works of Luther and Calvin in the original and, when available, in English translation. It’s a terrific resource for the kind of ecumenical work that Evangelicals and Catholics Together represents. However I do want to say to students: we’re all seduced by computers and digital research—but there’s a great joy in shelf browsing. How many times have we experienced this: you’re looking for a particular book, but then you see 10 books alongside of it of which you were unaware—books which treat a topic in unique ways you didn’t at first realize. Even though I spend most of my time in Walsh Library I do want to mention the importance of the Turro Seminary Library. It was built as a graduate theology library. Consequently, it has more resources in Latin, more books from the earlier tradition of the Church, more collections that perhaps would have been inaccessible to undergraduates but would be familiar to graduate students. Stella Wilkins is the librarian there and she and her staff have been very helpful. Many of our students are undergraduates who are just beginning to develop their research and writing skills. Is there any advice research you offer your own students that we can share with them? I think students can easily be intimidated by all that’s available today; it’s almost too much for them to digest. One of the things we try to do in the School of Theology is to conduct Research Seminars during which we introduce students to the library resources. We have not only librarians, but librarians and faculty together involved in these seminars. We go through the resources of Turro Seminary Library, and then the resources at Walsh Library, and try to introduce them to the basics of what library research is all about. I often tell students one of the most profitable things they can do is take two hours and just go through the digital resources available on the Library website. They will find extraordinary resources they didn’t know existed.